Amazon said flooding in Thailand and economic problems in Europe weighed on its financial results for the fourth quarter but it also said it was pleased with the results, which disappointed investors. Some observers were likely also disappointed that Amazon didn’t disclose unit sales figures for its popular Kindle e-readers. It said only that during the last nine weeks of 2011, Kindle unit sales, including the Fire tablet, increased 177 percent compared to the same period in 2010. 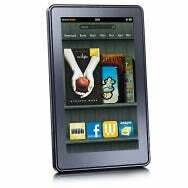 Some analysts believe Amazon makes very little money on the sale of Kindles, hoping to make money instead on e-book sales. That could be one reason Kindle sales didn’t seem to have much impact on Amazon’s profit. Its net income for the quarter dropped 58 percent to $177 million, compared to $416 million in the same quarter last year. But its sales disappointed too. Net sales grew 35 percent to $17.43 billion, below the $18.21 billion that analysts polled by Thomson Financial had hoped for. On a conference call to discuss the results, Amazon CFO Tom Szkutak said the company was pleased with the results and made generally glowing comments about the quarter without offering many details. Amazon is pleased with “great growth” in Kindle sales, “strong growth” in digital media including books, video and music, and “tremendous growth” in Amazon Web Services, he said. However, analysts on the call sounded displeased with Amazon’s continued investments back into its business, which they seemed to blame for the drop in profit. Amazon has been spending a lot on its business in recent years and it’s been paying off, said Gene Munster, a tech analyst at Piper Jaffrey. “The big surprise for investors tonight is what appears to be diminishing returns on that investment,” he said, asking Szkutak to comment. One such investment has been in people, with headcount up 67 percent in 2011 over the previous year. Most of those people are in operations and customer service, Szkutak said. The company has also been investing in capacity to support both Amazon Web Services and its retail business, he said.